If you’re looking for something worth leaving the house for tonight — this is it. We’ve teamed up with some friends to put together a benefit show for a couple of friends who recently fell victim to a terrible crime. You may have seen it mentioned on local news broadcasts over the last few weeks – but if you’re still in the dark, you can read up on it right here. 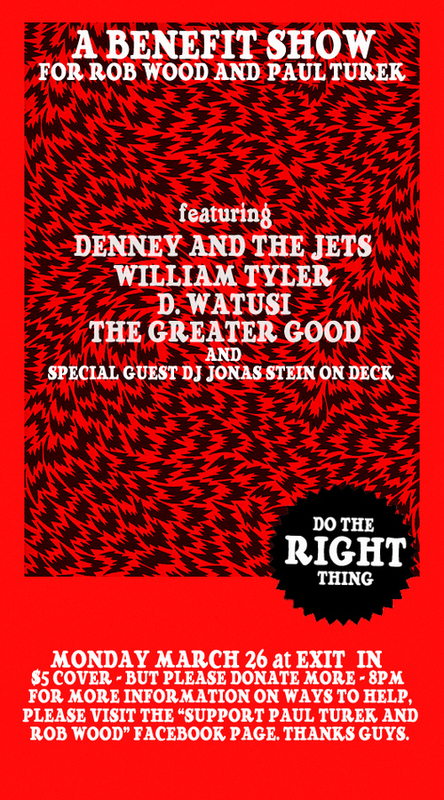 Tonight’s show will feature Denney & The Jets – William Tyler – D. Watusi – The Greater Good – and Mr. Jonas Stein [known in the DJ world as Sparkle City] A $5 cover will get you in the door, but everyone is strongly encouraged to donate more if you can. Every dollar that walks through the door tonight will go toward helping Paul and Rob to a speedy recovery while softening the blow on their wallets. Do the right thing… And if you can’t find your way to the show tonight, you can donate online right here. Any and all help is much appreciated.